"In the Broken Birdcage of Kathleen Fair"
When the mirror released Kathleen into the unknown, for the briefest of moments she giggled and realised that she’d never laughed before. She had been a blank canvas, sitting and waiting in a room and occasionally bouncing from wall to wall desperate for freedom - and now she was out. White walls no longer surrounded her. In this new place, a thousand mirrors spun reflecting worlds. There is magic within names. We can see it at work every day, while passing a signboard with a tempting name painted on it inviting the passerby to scan the show window of a cozy shop or to step over the threshold of a stylish little coffee house. We can see it at work on the book covers adorned with an alluring title seducing the reader to a further exploration of the pages that follow. “In the Broken Birdcage of Kathleen Fair” is a title with such magic, but it is not the only one of the kind among Cate Gardner’s works, she has a small history of such enticing titles. Fortunately, Cate Gardner’s fiction is more than just cheeky, original titles, but it is also a show of ingenuity and imagination without any borders in sight. Kathleen Fair is young girl held captive in a room where every single piece of furniture overtops her. The only door of the room is guarded, but an escaping way is revealed when a mirror appears on a wall and someone strange enters through it. Kathleen steps outside her room for the first time and discovers a cavern with thousands of mirrors reflecting and accessing thousands of worlds. And from this point her adventure begins. 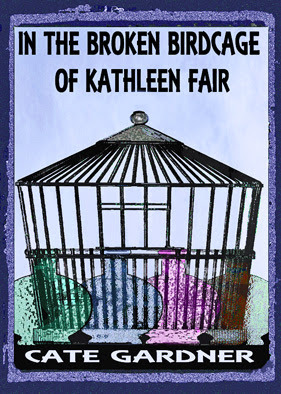 “In the Broken Birdcage of Kathleen Fair” is a delightful tale of love, discovery and courage. The readers will discover beyond the portals of mirrors, a chamber of a perfumer, one who collects “a dab of testosterone, lust and a hint of strawberry fields” in order to create his potions, or a sassy version of hell where invisible graffiti artists write warnings and contracts on the walls and the devil wears “a black suit over a grey t-shirt” while twirling an umbrella until “it flapped open and then he rested it against his shoulder.” There are promises and deals made, attempts to sneak out of them, a love triangle, or better still, quadrangle, and a hot air balloons contest. In a phrase, it is an exuberant display of imagination spiced with humor and a story that holds all the way to the end. Cate Gardner’s novella might bear reminiscences of a twisted rescue of Persephone from the underworld, Astrid Lindgren’s Nils Karlsson Pyssling or Patrick Süskind’s “Perfume”, but these tiny hints are, if you like, something borrowed for good luck, familiar elements used without abuse and without losing the originality of the story in the least. On the contrary, I could say that all these small, recognizable components are given a new dimension, transformed and blended perfectly in the unique creation that is “In the Broken Birdcage of Kathleen Fair”. There are also a couple questions that remain a mystery, some who and whys, but once again I believe that in letting these little things at the power of each reader’s mind Cate Gardner enhances the particularities of her story and gives it a feature personalized to the likings of everyone who picks up her novella. Cate Gardner might have published only in the shorter forms of fiction so far, stories, novellas, small novels, but every single one of them is written with exceptional skill and passion. “In the Broken Birdcage of Kathleen Fair” is the latest example of Cate Gardner’s prowess in weaving fantastical worlds and strange events and to confirm that she is one of the distinct voices of modern speculative fiction. Ah yes. I ought to get this one, as Cate has yet to disappoint. Thanks for a great review. Very much appreciated. Next time you want to review an Alchemy Press novella ask me for a review copy. Sounds like an interesting read! Love the bird cages from it as well!